Recently I mentioned its a good idea to walk in different area's of your town, to make walking more fun. So today we did just that here are some amazing pictures. 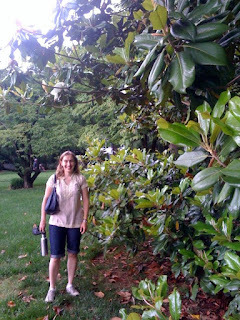 This was the biggest and most beautiful magnolia tree I have ever seen! I love taking walks. There's so many little adventure to be hand by the most mundane things. Thanks for sharing those photos. Looks like a lovely good time. Looks like you've got some beautiful places to explore. I'm still at my parents place so have been spending plenty of time out amongst the wilderness and enjoying every minute. What a great way to get some exercise. Thanks for taking us along. I bought bamboo poles to use as tomato stakes and I'm glad to see how to use them correctly. 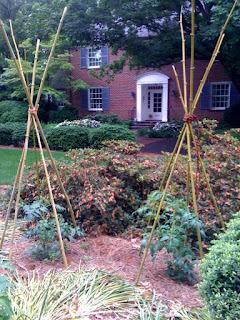 They look like Indian tee pees. We've planted several century old Cherokee purple tomatoes. They're the best. Jenn: love the quote adventures to be had by the mundane things- could be a script! Sweta: that will be me soon! 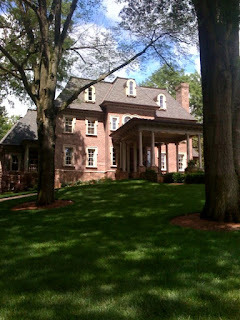 Girlichef:Notre Dame campus post your pics Americans have lovely Uni buildings we have some too oxford and cambridge in the UK we have wake forrest in winston and salem college for girls. Deb: you must have amazing places to walk when we were there we walked to a waterfall but I got eaten by mosquitoes !! Sam: those tomatoes sound great I need to get some, I guess the Indians grow them? I absolutely love to go on walks! My mom and I would always go for a walk around our neighborhood after dinner. I miss those days! 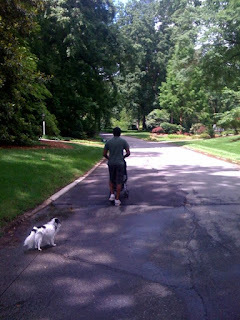 Thanks for your comment on my blog :) I would say with a little one you have your hands full! Love all your eating and walking adventures.